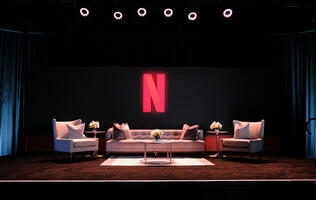 Note: This article was first published on April 20. In the early days of the SSD, they were prohibitively expensive. Just four years ago, a 240GB Intel SSD 520 Series SSD would have set you back over $500. Today, a 240GB drive can cost as little as $130. This dramatic fall in price means that more users and system manufacturers are ditching mechanical hard disk drives and turning to SSDs for storage. Though SSDs still cost more per gigabyte than traditional mechanical hard disk drives, they have one tremendous advantage and that’s performance. Even the most basic SSD will run circles round the fastest hard disk drive. In addition, SSDs are compact, which means system builders can build more portable and compact systems. SSDs are also much more power efficient, which means they are better suited for use in mobile devices like notebooks. While there’s a trend of an increasing amount of SSDs using the faster PCIe and M.2 interfaces, these SSDs are really designed for enthusiasts who want the absolute pinnacle of storage performance. For the rest of us, SATA SSDs are here to stay, and this is evidenced by the fact that SSD manufacturers are still coming up with new SATA SSD designs. In this round-up, we check out three of the latest entry-level SATA SSDs from OCZ, Samsung and Sony. 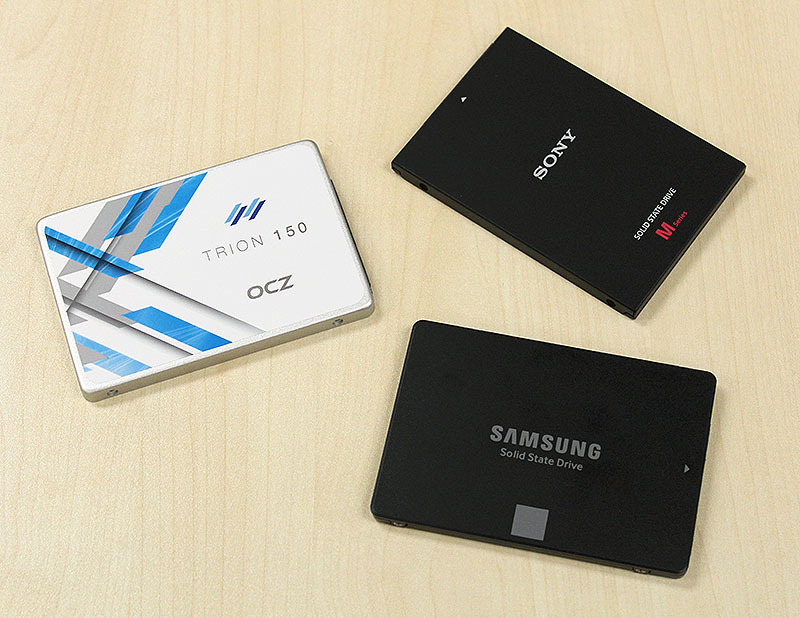 The Trion is OCZ’s range of entry-level drives and the new Trion 150 is essentially an update of the Trion 100 from last year. 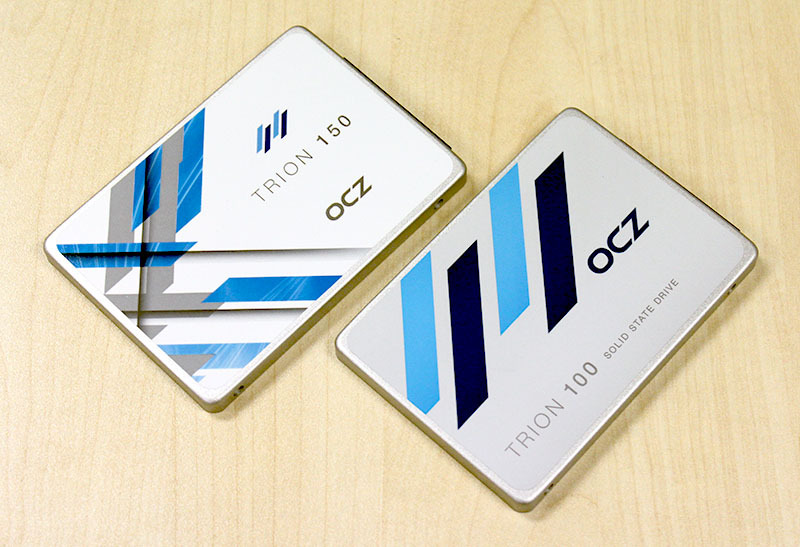 The Trion 100 from last year was OCZ’s first drive to employ the use of TLC NAND and the new Trion 150 is no different. In fact, the Trion 150 uses Toshiba’s latest 15nm TLC NAND. 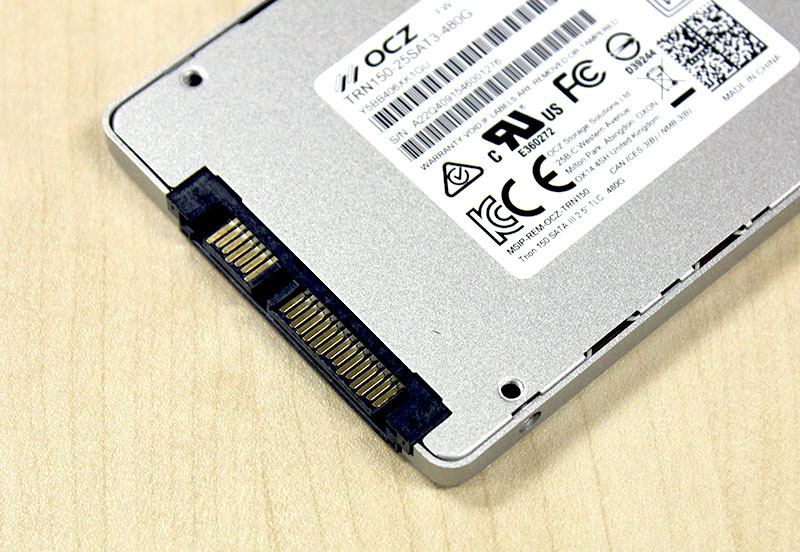 Apart from the shift to new 15nm TLC NAND, OCZ has also updated the firmware of the drive and has dedicated more capacity to the SLC buffer so as to improve overall performance. According to OCZ, they are claiming performance in certain scenarios to be boosted by as much as 50%. Endurance remains the same, and the 480GB variant that we have here is rated for up to 120TB total writes or 110GB a day. That’s plenty even for enthusiasts, as most mainstream consumer workloads only consume around 10GB to 30GB of writes a day. The controller of the new Trion 150, however, remains the same. 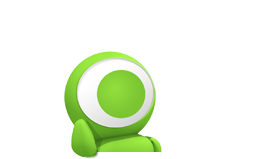 It’s the Toshiba TC58 and little details are known about it. However, we have read some reports of it as being a custom branded variant of the Phison’s new high-end PS3110-S10. Unfortunately, OCZ will neither confirm or deny this. If you are wondering why OCZ’s own Barefoot controller isn’t employed, it’s because the Barefoot controller is unable to support TLC NAND. As we mentioned earlier in the review of the Trion 100, one key improvement that this new Toshiba controller brings is the support for more aggressive DevSleep and power savings modes which will greatly benefit notebook users. You can read more in our review of the Trion 100, but the key figures to note is that in DevSleep and idle modes, we are looking at figures of just 6mW and 830mW respectively, which are greatly improved over OCZ’s own Barefoot controller. Like the earlier Trion 100, the new Trion 150 will be offered in four capacities - 120GB, 240GB, 480GB and 960GB - and will be offered with OCZ’s fantastic 3-year ShieldPlus warranty. 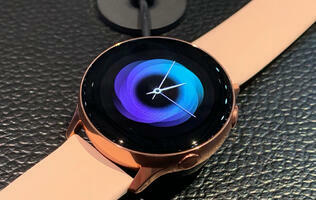 And since the Trion 150 is targeted at entry-level users, it comes without any accessories. 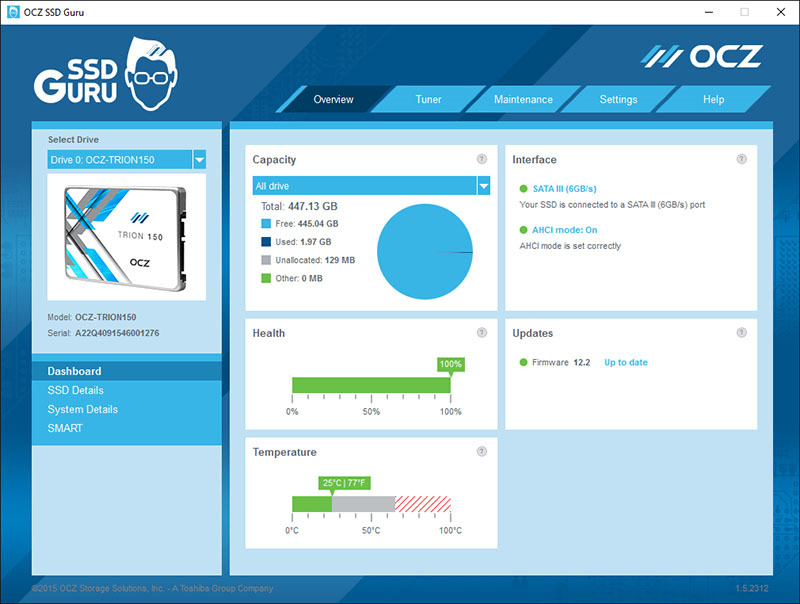 It is, however, compatible with OCZ’s SSD Guru utility which lets users easily manage and monitor their OCZ Trion 150 drives and update its firmware.